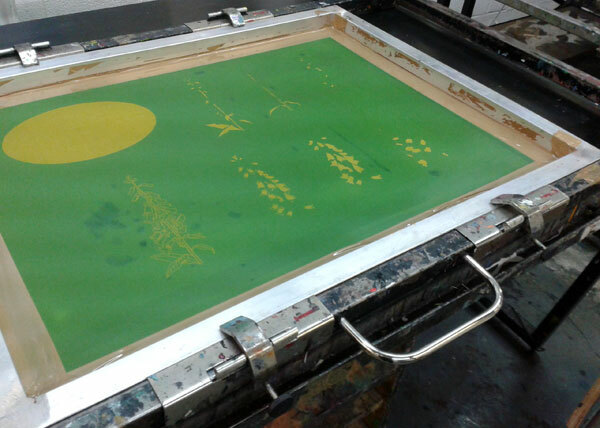 Last weekend I attended a screen printing course at the London Print Studio in West London. I’ve been wanting to have a go at printing some of my drawings for a while now, just to be more ‘arty’ really; rather than ‘cheating’ and printing everything through PhotoShop. 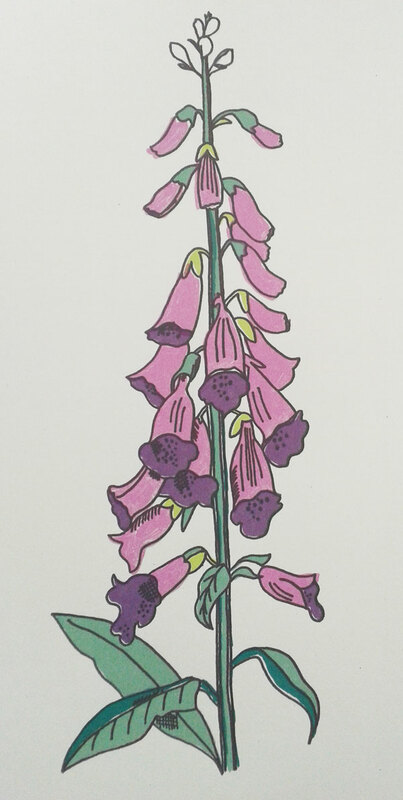 I decided to try and print my foxgloves drawing on the course to see how it would turn out. The plan was to print lots of layers to experiment with screen printing so I did 8. In hindsight this was a little optimistic but I guess I learnt a lot because I had chosen so many, and definitely had lots of screen printing practice too. I really like it but the colours are almost too perfect if you see what I mean, so screen printing seemed like a good option to give it a similar feel but with more texture. We started by breaking down the image into different layers and colours for printing. 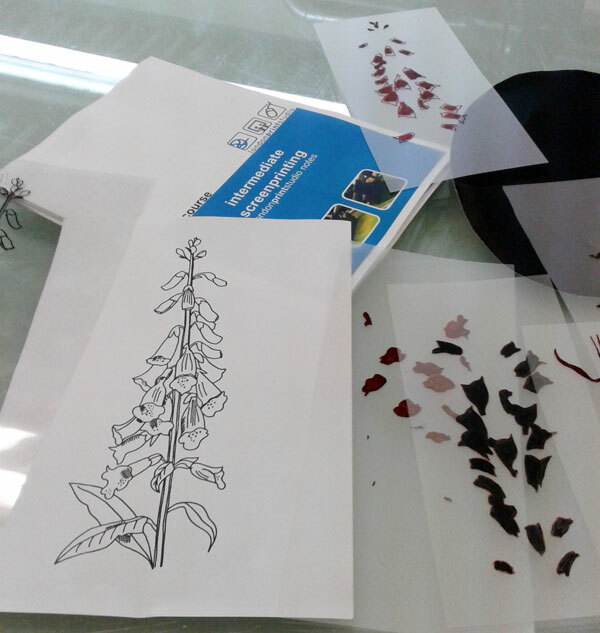 We did this by tracing the sections of the image onto acetate using pens and paints to get different effects. Then these were exposed onto the screen, all 8 of them! Next was the ink mixing to get the right colours – a really fun (and messy) bit but harder than you think as it’s kind of difficult to visualise how it’s going to look in your head, especially when time is limited. I had to mix 3 greens and 3 purples and choose a grey for the outline. So that was the end of day one, no printing done yet, just lots of preparation work. It was incredibly tiring nonetheless and I needed a nice glass of wine when I eventually arrived home that evening. 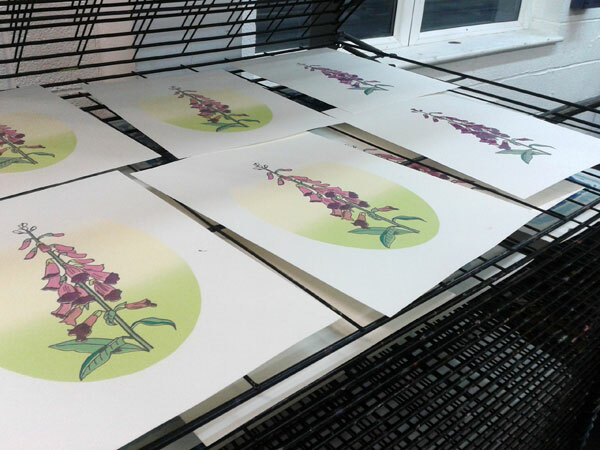 The next day was all about printing, yippee! You could sense everyone’s anticipation as we all started off printing our layers and looked forward to seeing the finished pieces of art work at the end of the day. Here’s where I wished I hadn’t done 8 layers; I’m really not known for my patience so it was very hard for me! These are my prints drying on the rack, some with a graduated oval background, some with just a white background (which I preferred). And here’s a close up of one of my prints. Not perfect but not bad and I learnt so much about layering.